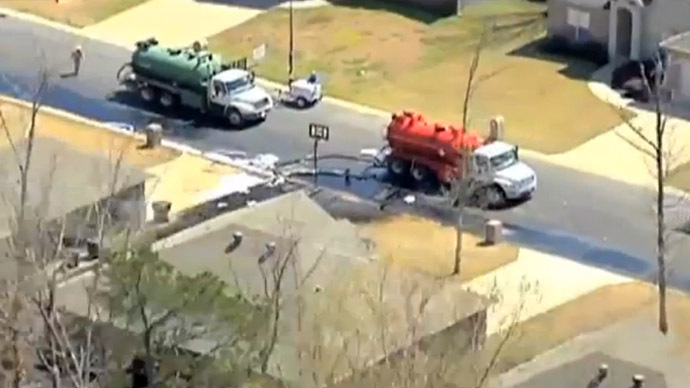 After thousands of barrels of crude oil spilled from ExxonMobil’s Pegasus pipeline over Easter weekend in the small Arkansas town, residents who were forced to evacuate from the 22 affected households continue to wonder what will become of their neighborhood and their lives. While many are still unsure when they will one day be able to come home, questions about the energy giant's cleanup and compensation efforts have left both local residents and state officials less than satisfied. "ExxonMobil is paying for the cleanup and will honor all valid claims. Reports to the contrary are inaccurate," said ExxonMobil in a statement. Arkansas Attorney General Dustin McDaniel, who spoke of litigation as a “certainty,” derided attempts by ExxonMobil representatives to manage his visit to the site. “I explained to them I’m not here for a tour and I’m not getting in a van. We’re here on behalf of the State of Arkansas as the state’s lawyer, a constitutional officer empowered by the General Assembly to enforce our laws, and we’re here to conduct an investigation, not take a tour,” the Log Cabin Democrat cites him as saying on Wednesday. McDaniel said he had issued a subpoena for documents, data and other evidence from ExxonMobil pertaining to the ruptured pipeline, setting an April 10 deadline for the oil and gas conglomerate to produce the requested evidence. 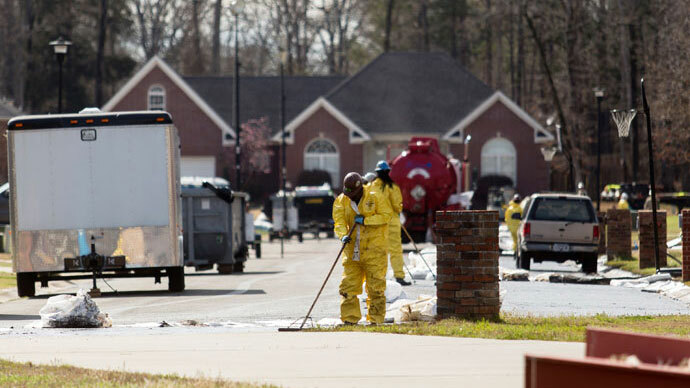 McDaniel characterized the affected area as something out of the post-apocalyptic TV series 'The Walking Dead,’ where “people in Hazmat suits” scoured the otherwise abandoned streets. The attorney general estimated that some 600 responders were currently on the ground, not counting those who were offering assistance off site. “I hope they realize for the homeowners in this area, it is not small. It is catastrophic. For those who fear for their drinking water, it is not great,” the attorney general continued. Even Republican lawmaker Tim Griffin also spoke of the palpable environmental impact the spill had had. “I have confidence if there’s a problem we need to know about, the EPA (Environmental Protection Agency) and the Department of Transportation would tell us,” the daily cites him as saying. 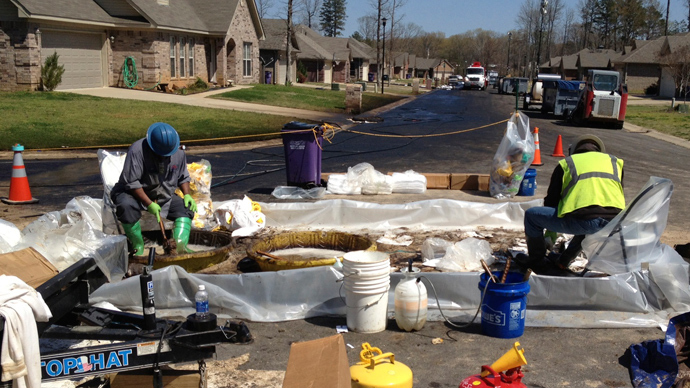 ExxonMobile paints a different image on its Twitter feed, stating its cleanup teams are "working around the clock" in Mayflower. While McDaniel says ExonMobil’s legal office has thus far responded in good faith to his requests, residents feel that the oil conglomerate is being evasive about compensation details. However, resident Chris Harrell posted to his Twitter after meeting with ExxonMobil that claims would only be dealt with individually and following the completion of the cleanup. He had previously said that ExxonMobil had given no assurances as to when the cleanup would be finished. For the company's part, Griffin, the local GOP legislator, said it would be a matter of days, not weeks before residents from the 22 households forced to evacuate would be allowed to return. He said the responders were currently removing soil saturated with crude oil and doing other landscape work so that people would be able to return home. “One neighbor told me there was a sense of a ‘divide and conquer’ mentality on the Exxon side. Officials continually stated that questions and claims would be handled individually on a case by case basis,” Harrell continued. After suffering several bouts of headaches and dizziness, Harrell expressed fears about the "longtime health impact on residents of the area, and particularly children." "My 4-year-old daughter complained of a stomach ache yesterday at her preschool. It may have had no relation to the oil but it definitely raises concern." 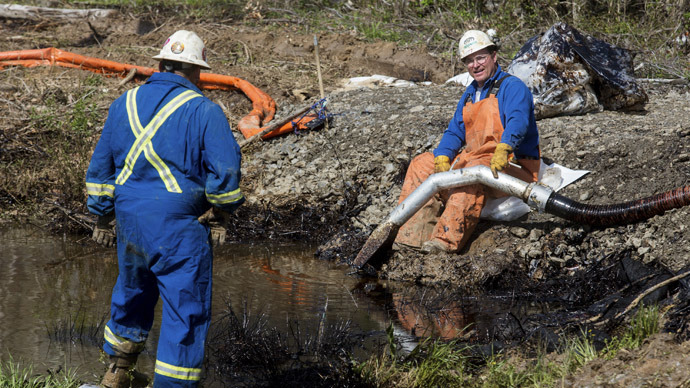 With ExxonMobil saying that some 10,000 barrels – that's 420,000 gallons – of oil had been recovered, the company estimates that between 3,500-5,000 barrels of the crude mixture known as “tar sands” were spilled following the rupture. The Pegasus pipeline, which can carry 90,000 barrels of crude from Illinois to Texas per day, crosses 13 miles of the Lake Maumelle watershed. The watershed incidentally provides much of the water for the Arkansas state capital, Little Rock. When the pipeline ruptured on Friday, it was carrying Canadian Wabasca Heavy crude, a bitumen oil originating in the Canadian province of Alberta. And while environmentalists have classified tar sand oil as more hazardous than conventional crude, oil companies transporting it are actually exempt from a tax that doubles as dues to the Oil Spill Liability Trust Fund, which was established to force owners to pay for the containment, cleanup and damages resulting from a given spill. “The Oil Spill Liability Trust Fund is funded by an 8-cent-per-barrel excise tax on domestically produced and imported crude oil and on imported refined products such as gasoline," David Turnbull, the Campaigns Director from Oil Change International told RT. "However, the IRS has classified tar sands as different from conventional oil, and thus the tax levied to fill the liability trust fund is not levied on tar sands crude." Turnbull argues that the loophole should be closed, as it doesn’t line up with the actual intent of the tax or the fund. “Given how toxic and dangerous tar sands oil – or bitumen – is, it’s entirely irrational that this oil would be exempt from being taxed in order to pay for the Oil Spill Liability Trust Fund. As these sorts of heavy oils that are exempt from this tax continue to make up a larger percentage of oil transported in the US, it will only serve to stretch the fund even further, while putting families, communities and ecosystems at greater risk,” he continued. After the Federal Aviation Administration (FAA) announced a temporary no-fly zone over the Arkansas oil spill on Monday, speculation abounded that the ban was an attempt to keep the media from fully assessing the impact of the spill. The FAA further prompted fears ExxonMobile had been given a free hand in managing the situation by saying that “only relief aircraft operations under direction of Tom Suhrhoff” – who identified himself as an aviation adviser for ExxonMobil on his LinkedIn profile – were permitted in the area.